E. Aprile et al. 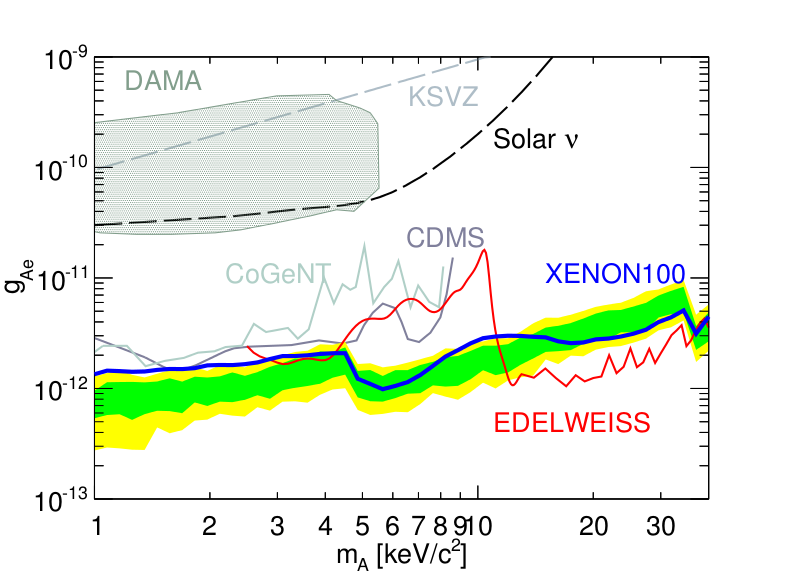 (XENON100), First Axion Results from the XENON100 Experiment, Physical Review D 90, 062009 (2014) and arXiv:1404.1455. Is it better a dark matter WIMP or the Imp from GoT? I don’t know, but I would rather advice you to not forget the axions from GUT – Grand Unification Theories. Axions, if they exist, could solve several yet unsolved problems in understanding our Universe and in the description of the forces that govern the subatomic world. The axions have been postulated by Roberto Peccei and Helen Quinn in 1977 to explain the discrepancy between theory and observation in Quantum Chromodynamics for what concern the Charge-Parity Violation. They could be an excellent dark matter candidate and solve at the same time the CPV problem. What does this mean? In the Standard Model of particle physics, the fundamental force that regulates the interaction among the quarks is called the Strong Force. Let me remind you that the quarks are thought to be the fundamental constituent of the hadrons, among which we have the nucleons, i.e. the protons and neutrons which made the atoms. We know that the quarks come with a colour. To be clear, this colour is just a conventional name without implying that quarks are literally red, green or blue. It’s just a way to distinguish different kinds of quarks. Because of these colours, the quantum theory formalism that describes the quarks gets the name of chromo: Quantum Chromo Dynamics or QCD. Now, in the Standard Model we have another force, called the Weak Force. This Weak Force is responsible of the decay of the nuclei; and whenever a neutrino is involved. Why do we care about Weak Interaction if the axons deal with Strong one? This is because of the CP symmetry violation. Already in 1964 it was found that the Weak Interaction violates the CP symmetry. The fundamental particles may come with a charge (C), like the electron, and with a parity (P), which can be seen as a spatial symmetry. Like the human face which is symmetric (although not perfectly symmetric) between left and right. Before 1964 it was expected that by changing the charge of a particle (performing a so called charge conjugation) you get something different from what you had at the beginning: a positron is not an electron, but it is its charged-conjugated partner. The same thing was expected to happen with the parity conjugation: imagine to put a particle in front of a mirror, the mirrored particle won’t be the same as the original one. However, it was believed that if you combine these two transformations (if you make a CP conjugation) you obtain the same situation as the one present at the beginning of the process. Well, in 1964, it was proven that this is not the case for the Weak Interactions, that is to say: Weak Interactions violate the CP symmetry. Nowadays we understand this process better and we can precisely describe this violation within the Standard Model of particle physics. This CP symmetry violation, although perfectly fine with the Standard Model, has not been observed in the Strong Interaction. Imagine that you see a leaf that is about to fall from a branch, but never falls. The fall is predicted by the gravity, but it doesn’t happen. There must be something wrong! Or maybe we must be missing something. Like, the leaf being stuck to the branch. So, what is it happening to the Strong Interactions? Why haven’t we yet observed the CP violation in the Strong sector of the Standard Model? We don’t know… yet. To solve this problem, Peccei and Quinn have introduced this new particle, the axion, that takes away the CP violation in the Strong Interaction processes, restoring the symmetry. It is like preventing the leaf to fall, and making the violation invisible. Why is this important for us? Simple: now that the Higgs boson has been discovered and we have a clearer idea on how the particles acquire the mass they have, we are still unable to explain why we are living in a matter-dominated universe rather than an antimatter-dominated one. The definition of what is matter and what is antimatter is a purely human artifact: the two options, matter or antimatter universes, would be completely indistinguishable in terms of the laws of nature. The only difference you might experience is that instead of switching on the light letting the electrons flowing, you would do the same using positrons instead. So why the Nature has chosen the matter (electron) instead of the antimatter (positron)? We think that the solution lies in understanding the CP violation. And the axion is one of the keystones in the building of this cathedral. There are several experimental groups searching for these particles, and many theoretical physicists are working on various axion models (oscillating between predictions and readjustment, once experimental results get published). Concerning the experimental searches, it was recently realized that the dark matter detectors (like CDMS, EDELWEISS or xenon-based instruments) can be particularly suitable for such a challenge. About one year ago, we understood that XENON100 could play in the world championship of this competition, maybe winning the AC (not the America’s Cup, but the Axion’s Cup). So we have involved ourselves in this venture. Supported by several theoretical models (also arising from Grand Unification Theories) we expect the axions to interact with the normal matter by coupling either to photons, nucleon or electrons. By normal baryonic matter we mean the building blocks that constitute the Universe to which we naturally interacts. Everything you see, everything you touch is normal baryonic matter. Also XENON100 is made only of baryonic matter. With it we could test the axion-electron coupling. This means that to explore the existence of this very elusive particles, we tried to observe the probability of an axion to kick out an electron from the xenon atoms (see the figure below). This process is called the axio-electric effect. The axio-electric effect converts an axion A into an electron e-, in the presence of either a nucleus Z+ or another electron e-. 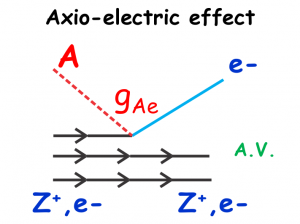 The axio-electric effect is very similar to the photo-electric effect (whose discovery won Albert Einstein the Nobel Prize of Physics in 1921), with a crucial difference though: in our case instead of a photon we consider an axion hitting the electron and ionizing the xenon target. 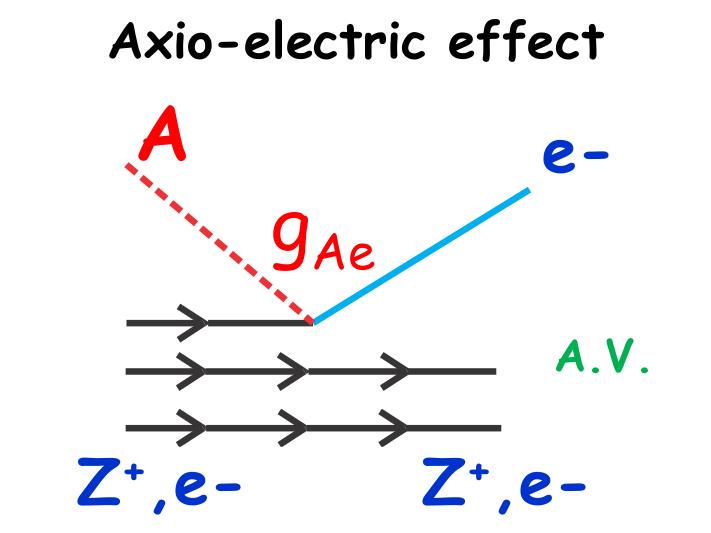 The axio-electric effect was first introduced and formalized by A. Derevianko and others in the late 1990s. What happen when an axion hits our xenon target? It generates a small spark, which is immediately detected by the photomultiplier tubes, which continuously monitor the situation inside XENON100. XENON100 particularly good in discovering the axions through this effect. The secret lies in the cleanliness of the detector. 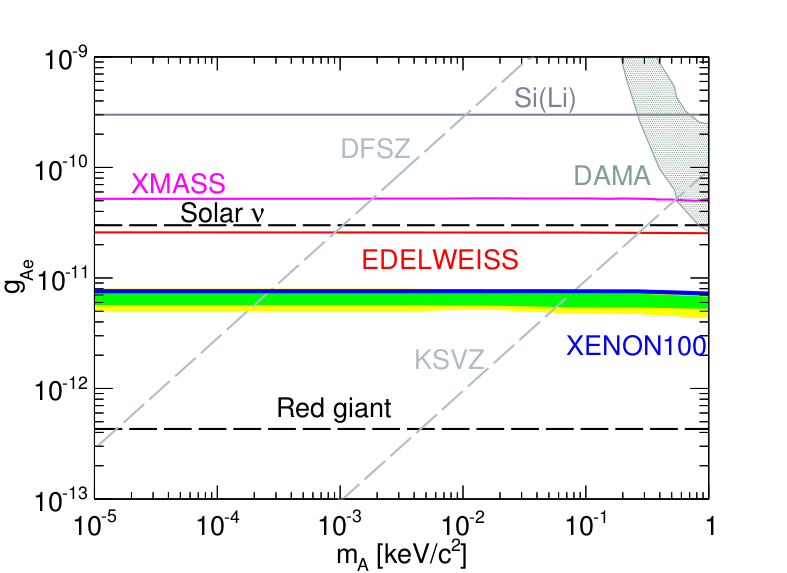 XENON100 is definitively one of the cleanest places of the Universe. In which sense? Everything that is surrounding us is radioactive, emits radiation which continuously hits us: when you wash your hands you receive quite some amount of radiation, particularly if the washbasin is made of ceramic, because of the cobalt contained in the ceramic. This radiation is completely harmless for your body so we never worry about it. But in contrast, if you put the same amount of ceramic inside XENON100, the whole experiment would be spoiled! Hence, every single component has been carefully selected and the detector is operated in such a way that everything that generates a spark in its interior can be considered as good signal, and not some spurious radiation. To give you an idea of the cleanliness of the XENON100 detector: imagine that you could sit inside the inner part of the XENON detector (wear the proper clothes, since the temperature is about -100 degrees). That place is so radiation-clean that you will have to wait for about a day between one low-energy event and another. All this means that if we see some light we have quite a good chance that this light is coming from something interesting — such as axions. We have carefully run our experiment for more than a year, taking care of it like a sacred cow. We then skimmed the data that we collected during that time. At the end of the skimming procedure we have found no evidences of axions, as shown below. What you see in the plot is the following: on the y-axis we show the coupling of the axion with the electron, i.e. a way to describe the probability they interact with the electrons; on the x-axis we shod the hypothetical mass of the axion. Since we don’t know either the coupling nor the mass, we have to plot them in such a graph, in order to check where they like to live (for a given mass the corresponding coupling and vice-versa). In these so-called exclusion plots, we show different experiments (whose names you can find on the plot) which have excluded certain phase space: each point [coupling, mass] above the line for a particular experiment has been rejected, and if the axion exist, it can be only be in the region below these lines. For example, it is highly impossible that an axion in the galaxy can have a mass of 2 keV and a coupling to the electrons 1E-11 (i.e. one in eight hundredth of millionth), since these characteristic have been excluded by CoGeNT, CDMS, EDELWEISS and more recently by XENON100. An axion with a mass of 2 keV and a coupling of 1E-13 is still possible: we haven’t been able to search for that yet. You can think of it like fishing: we try to go deeper and deeper with our fishing rods in different places of the lake. You can immediately see that the XENON100 has reached the deepest level in this search with respect to the other fishermen. It has taken 40 years before finding the Higgs boson. The hunt for the axion has just started. We are out in front for tracking down these fundamental, elusive particles. This entry was posted in Publications, Science and tagged 2014, analysis, axions, dark matter, publications, results, science, XENON100 on April 13, 2014 by Paolo Beltrame.